The variation between magnetic north and "true" north. 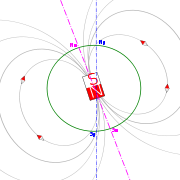 Earth's magnetic field (and the surface magnetic field) is approximately a magnetic dipole, with the magnetic field S pole near the Earth's geographic north pole (see Magnetic North Pole) and the other magnetic field N pole near the Earth's geographic south pole (see Magnetic South Pole). This makes the compass usable for navigation. The cause of the field can be explained by dynamo theory. A magnetic field extends infinitely, though it weakens with distance from its source. The Earth's magnetic field, also called the geomagnetic field, which effectively extends several tens of thousands of kilometres into space, forms the Earth's magnetosphere. A paleomagnetic study of Australian red dacite and pillow basalt has estimated the magnetic field to be at least 3.5 billion years old. Simulation of the interaction between Earth's magnetic field and the interplanetary magnetic field. Earth is largely protected from the solar wind, a stream of energetic charged particles emanating from the Sun, by its magnetic field, which deflects most of the charged particles. Some of the charged particles from the solar wind are trapped in the Van Allen radiation belt. A smaller number of particles from the solar wind manage to travel, as though on an electromagnetic energy transmission line, to the Earth's upper atmosphere and ionosphere in the auroral zones. The only time the solar wind is observable on the Earth is when it is strong enough to produce phenomena such as the aurora and geomagnetic storms. Bright auroras strongly heat the ionosphere, causing its plasma to expand into the magnetosphere, increasing the size of the plasma geosphere, and causing escape of atmospheric matter into the solar wind. Geomagnetic storms result when the pressure of plasmas contained inside the magnetosphere is sufficiently large to inflate and thereby distort the geomagnetic field. The solar wind is responsible for the overall shape of Earth's magnetosphere, and fluctuations in its speed, density, direction, and entrained magnetic field strongly affect Earth's local space environment. For example, the levels of ionizing radiation and radio interference can vary by factors of hundreds to thousands; and the shape and location of the magnetopause and bow shock wave upstream of it can change by several Earth radii, exposing geosynchronous satellites to the direct solar wind. These phenomena are collectively called space weather. The mechanism of atmospheric stripping is caused by gas being caught in bubbles of magnetic field, which are ripped off by solar winds. 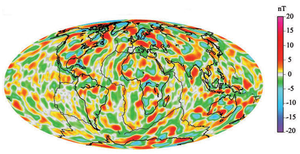 Variations in the magnetic field strength have been correlated to rainfall variation within the tropics. The positions of the magnetic poles can be defined in at least two ways. Often, a magnetic (dip) pole is viewed as a point on the Earth's surface where the magnetic field is entirely vertical. Another way of saying this is that the inclination of the Earth's field is 90° at the North Magnetic Pole and -90° at the South Magnetic Pole. At a magnetic pole, a compass held in the horizontal plane points randomly, while otherwise it points nearly to the North Magnetic Pole or away from the South Magnetic Pole, though local deviations exist. The two poles wander independently of each other and are not at directly opposite positions on the globe. Magnetic dip pole can migrate rapidly, observation of up to 40 km per year have been made for the North Magnetic Pole. The Earth's magnetic field can be closely approximated by the field of a magnetic dipole positioned near the centre of the Earth. A dipole's orientation is defined by an axis. The two positions where the axis of the dipole that best fits the geomagnetic field intersect the Earth's surface are called the North and South geomagnetic poles. For best fit the dipole representing the geomagnetic field should be placed about 500 km off the center of the Earth. This causes the inner radiation belt to skim lower in Southern Atlantic ocean, where the surface field is the weakest, creating what is called the South Atlantic Anomaly. If the Earth's magnetic field were perfectly dipolar, the geomagnetic and magnetic dip poles would coincide. However, significant non-dipolar terms in an accurate description of the geomagnetic field cause the position of the two pole types to be in different places. The strength of the field at the Earth's surface ranges from less than 30 microteslas (0.3 gauss) in an area including most of South America and South Africa to over 60 microteslas (0.6 gauss) around the magnetic poles in northern Canada and south of Australia, and in part of Siberia. The average magnetic field strength in the Earth's outer core was measured to be 25 Gauss, 50 times stronger than the magnetic field at the surface. The field is similar to that of a bar magnet. The Earth's magnetic field is mostly caused by electric currents in the liquid outer core. The Earth's core is hotter than 1043 K, the Curie point temperature above which the orientations of spins within iron become randomized. Such randomization causes the substance to lose its magnetization. Convection of molten iron within the outer liquid core, along with a Coriolis effect caused by the overall planetary rotation, tends to organize these "electric currents" in rolls aligned along the north-south polar axis. When conducting fluid flows across an existing magnetic field, electric currents are induced, which in turn creates another magnetic field. When this magnetic field reinforces the original magnetic field, a dynamo is created that sustains itself. This is called the Dynamo Theory and it explains how the Earth's magnetic field is sustained. Another feature that distinguishes the Earth magnetically from a bar magnet is its magnetosphere. At large distances from the planet, this dominates the surface magnetic field. Electric currents induced in the ionosphere also generate magnetic fields. Such a field is always generated near where the atmosphere is closest to the Sun, causing daily alterations that can deflect surface magnetic fields by as much as one degree. Typical daily variations of field strength are about 25 nanoteslas (nT) (i.e. ~ 1:2,000), with variations over a few seconds of typically around 1 nT (i.e. ~ 1:50,000). Geomagnetic variations since last reversal. The currents in the core of the Earth that create its magnetic field started up at least 3,450 million years ago. Magnetometers detect minute deviations in the Earth's magnetic field caused by iron artifacts, kilns, some types of stone structures, and even ditches and middens in archaeological geophysics. Using magnetic instruments adapted from airborne magnetic anomaly detectors developed during World War II to detect submarines, the magnetic variations across the ocean floor have been mapped. The basalt — the iron-rich, volcanic rock making up the ocean floor — contains a strongly magnetic mineral (magnetite) and can locally distort compass readings. The distortion was recognized by Icelandic mariners as early as the late 18th century. More important, because the presence of magnetite gives the basalt measurable magnetic properties, these magnetic variations have provided another means to study the deep ocean floor. When newly formed rock cools, such magnetic materials record the Earth's magnetic field. Frequently, the Earth's magnetosphere is hit by solar flares causing geomagnetic storms, provoking displays of aurorae. The short-term instability of the magnetic field is measured with the K-index. Recently, leaks have been detected in the magnetic field, which interact with the Sun's solar wind in a manner opposite to the original hypothesis. During solar storms, this could result in large-scale blackouts and disruptions in artificial satellites. Based upon the study of lava flows of basalt throughout the world, it has been proposed that the Earth's magnetic field reverses at intervals, ranging from tens of thousands to many millions of years, with an average interval of approximately 300,000 years. However, the last such event, called the Brunhes–Matuyama reversal, is observed to have occurred some 780,000 years ago. There is no clear theory as to how the geomagnetic reversals might have occurred . Some scientists have produced models for the core of the Earth wherein the magnetic field is only quasi-stable and the poles can spontaneously migrate from one orientation to the other over the course of a few hundred to a few thousand years. Other scientists propose that the geodynamo first turns itself off, either spontaneously or through some external action like a comet impact, and then restarts itself with the magnetic "North" pole pointing either North or South. External events are not likely to be routine causes of magnetic field reversals due to the lack of a correlation between the age of impact craters and the timing of reversals. Regardless of the cause, when the magnetic pole flips from one hemisphere to the other this is known as a reversal, whereas temporary dipole tilt variations that take the dipole axis across the equator and then back to the original polarity are known as excursions. Studies of lava flows on Steens Mountain, Oregon, indicate that the magnetic field could have shifted at a rate of up to 6 degrees per day at some time in Earth's history, which significantly challenges the popular understanding of how the Earth's magnetic field works. Paleomagnetic studies such as these typically consist of measurements of the remnant magnetization of igneous rock from volcanic events. Sediments laid on the ocean floor orient themselves with the local magnetic field, a signal that can be recorded as they solidify. Although deposits of igneous rock are mostly paramagnetic, they do contain traces of ferri- and antiferromagnetic materials in the form of ferrous oxides, thus giving them the ability to possess remnant magnetization. In fact, this characteristic is quite common in numerous other types of rocks and sediments found throughout the world. One of the most common of these oxides found in natural rock deposits is magnetite. 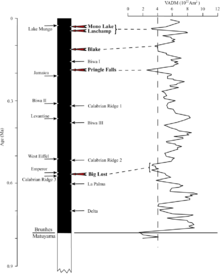 As an example of how this property of igneous rocks allows us to determine that the Earth's field has reversed in the past, consider measurements of magnetism across ocean ridges. Before magma exits the mantle through a fissure, it is at an extremely high temperature, above the Curie temperature of any ferrous oxide that it may contain. The lava begins to cool and solidify once it enters the ocean, allowing these ferrous oxides to eventually regain their magnetic properties, specifically, the ability to hold a remnant magnetization. Assuming that the only magnetic field present at these locations is that associated with the Earth itself, this solidified rock becomes magnetized in the direction of the geomagnetic field. Although the strength of the field is rather weak and the iron content of typical rock samples is small, the relatively small remnant magnetization of the samples is well within the resolution of modern magnetometers. The age and magnetization of solidified lava samples can then be measured to determine the orientation of the geomagnetic field during ancient eras. The Earth's magnetic field strength was measured by Carl Friedrich Gauss in 1835 and has been repeatedly measured since then, showing a relative decay of about 10% over the last 150 years. The Magsat satellite and later satellites have used 3-axis vector magnetometers to probe the 3-D structure of the Earth's magnetic field. 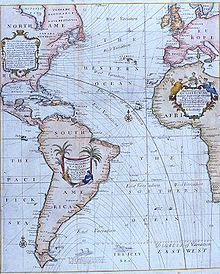 The later Ørsted satellite allowed a comparison indicating a dynamic geodynamo in action that appears to be giving rise to an alternate pole under the Atlantic Ocean west of S. Africa. The International Real-time Magnetic Observatory Network, with over 100 interlinked geomagnetic observatories around the world has been recording the earths magnetic field since 1991. The military determines local geomagnetic field characteristics, in order to detect anomalies in the natural background that might be caused by a significant metallic object such as a submerged submarine. Typically, these magnetic anomaly detectors are flown in aircraft like the UK's Nimrod or towed as an instrument or an array of instruments from surface ships. Commercially, geophysical prospecting companies also use magnetic detectors to identify naturally occurring anomalies from ore bodies, such as the Kursk Magnetic Anomaly. Animals including birds and turtles can detect the Earth's magnetic field, and use the field to navigate during migration. Cows and wild deer tend to align their bodies north-south while relaxing, but not when the animals are under high voltage power lines, leading researchers to believe magnetism is responsible. Seismo-electromagnetics is an area of research aimed at earthquake prediction. ^ B. A. Buffett. Earth's Core and the Geodynamo. Science, vol. 288 (5473), 2000, pp. 2007 - 2012. DOI: 10.1126/science.288.5473.2007. ^ AFP (2009-01-13). "Earth's Magnetic Field Changes Climate". Discovery News. http://dsc.discovery.com/news/2009/01/13/magnetic-field-climate.html. Retrieved 2010-02-24. ^ "Problem with the "MAGNETIC" Pole Locations on Global Charts". Eos Vol. 77, No. 36, American Geophysical Union, 1996. ^ Geomagnetism, North Magnetic Pole. Natural Resources Canada, 2005-03-13. ^ South Magnetic Pole. Commonwealth of Australia, Australian Antarctic Division, 2002. ^ Thompson, Andrea (December 16, 2008). "Leaks Found in Earth's Protective Magnetic Shield". Space.com. 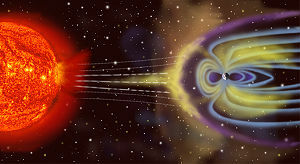 Imaginova Corp.. http://www.space.com/scienceastronomy/081216-agu-solar-storm-shield-break.html. Retrieved 2009-03-28. ^ Phillips, Tony (December 29, 2003). "Earth's Inconstant Magnetic Field". Science@Nasa. http://science.nasa.gov/science-news/science-at-nasa/2003/29dec_magneticfield/. Retrieved December 27, 2009. ^ Coe, R. S.; Prévot, M.; Camps, P. (20 April 1995). "New evidence for extraordinarily rapid change of the geomagnetic field during a reversal". Nature 374: 687. doi:10.1038/374687a0. http://www.nature.com/nature/journal/v374/n6524/abs/374687a0.html. ^ Hulot G, Eymin C, Langlais B, Mandea M, Olsen N (April 2002). "Small-scale structure of the geodynamo inferred from Oersted and Magsat satellite data". Nature 416 (6881): 620–3. doi:10.1038/416620a. PMID 11948347. ^ Burda, H; Begall, S; Cerveny, J; Neef, J; Nemec, P (Mar 2009). "Extremely low-frequency electromagnetic fields disrupt magnetic alignment of ruminants.". Proceedings of the National Academy of Sciences of the United States of America 106 (14): 5708–13. doi:10.1073/pnas.0811194106. PMID 19299504. ^ Dyson, PJ (2009). "Biology: Electric cows". Nature 458 (7237): 389. doi:10.1038/458389a. PMID 19325587. William J. Broad, Will Compasses Point South?. New York Times, July 13, 2004. This article is licensed under the GNU Free Documentation License. It uses material from the article "Earth's magnetic field".